Books in the library are organized by a classification scheme called Library of Congress. 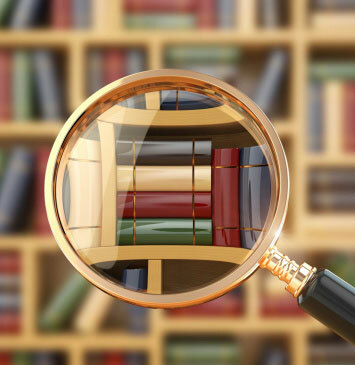 You may be more familiar with Dewey Decimal Classification that's often used in public libraries and in schools, so we have included a description of Library of Congress (LC) and how it works. Each book has a call number that identifies its unique position on the shelf. This is indicated on a small white sticker at the base of the book's spine, and is organized by subject. The first portion of the call number is letters that indicate the subject of the text. For example, "P" is the code for language and literature. These are arranged alphabetically on the shelf, so you'll find A before E.
Different editions of the same title are distinguished by the year of publication, which is listed at the end of the call number. These are shelved in sequential order. Visit the Library of Congress website for a full list of the subjects. For more detail on each of these subjects, visit the Wikipedia page that lists subtopics. The Library of Congress website provides detailed information on the subtopics in PDF and Microsoft Word forms.